It is not a given that we must lose teeth as we age. If we maintain good oral hygiene and have regular professional cleanings, chances are we can keep our natural teeth for life. One of the biggest threats to oral hygiene is gum disease, defined as a bacterial infection that threatens the tissue supporting your teeth. During regular check-ups, the team at Nicole M. Paxson, D.D.S., seeks out early signs of gum disease. If they see something, the solution is periodontal therapy. Periodontal therapy can take different forms, but the goal is always to restore diseased tissues to health. The best way to avoid the need for periodontal therapy, though, is to brush and floss daily. Effective brushing and flossing are key. Scrub too hard and you can cause your gums to recede. Don’t brush thoroughly and you miss floss and plaque. 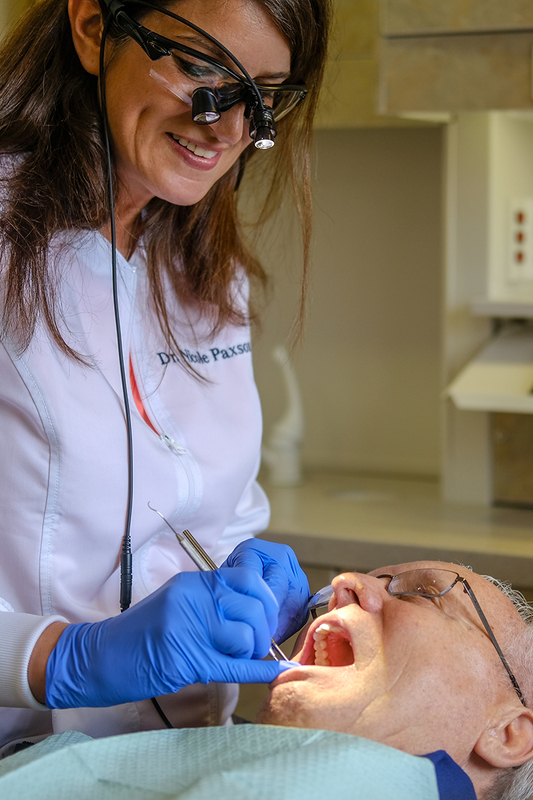 Dr. Paxson’s staff is happy to demonstrate proper technique during your appointments. Remember, too, that there are some areas of the mouth that a toothbrush and floss just can’t reach, which is why it’s so important to have regular professional cleanings with Dr. Paxson’s team. We also may see early signs of gum disease before you experience any discomfort. Eating a nutritious diet low in sugar and staying away from tobacco in all forms will also increase your periodontal health — and your chances of keeping your teeth for life. These deep-cleaning techniques are the best starting point to control gum disease. Plaque and calculus (tartar) are removed from beneath the gum tissues using hand scalers and ultrasonic instruments. Dr. Paxson can perform minor surgical procedures to create a more pleasing appearance of the gum tissues. This is a surgical procedure in which tooth structure that is covered by gum and bone tissue may need to be exposed either for cosmetic reasons (to make the teeth look longer and the smile less gummy) or to aid in securing a new dental crown. Today’s preferred method of tooth replacement is a titanium dental implant, which is placed beneath the gum line and into the jawbone during a minor surgical procedure. The implant is then attached to a realistic-looking dental crown that is visible above the gum line and indistinguishable from a natural tooth.